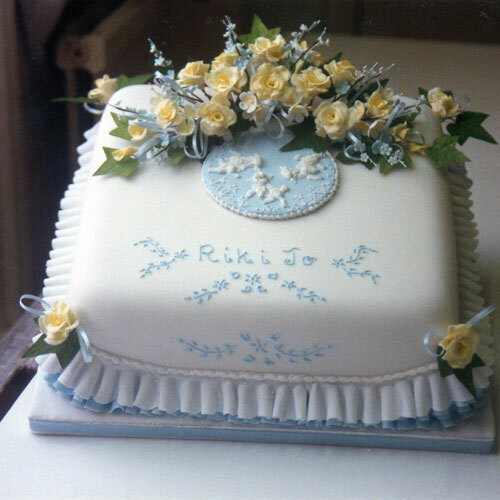 This Christening cake is decorated with yellow Roses, blue Blossoms, Ivy Leaves & twin cribs. Pastillage is used to make the cribs, which dries hard, keeps its shape & is resistant to humidity. 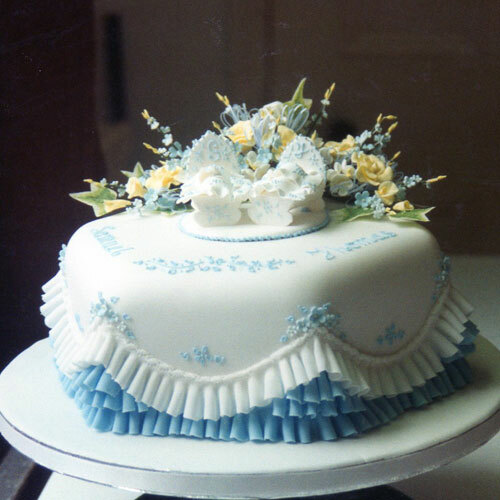 The cake features a triple blue & a single white Garrett Frill. 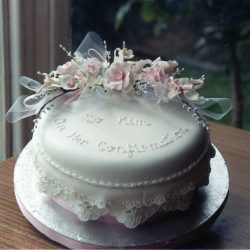 This Christening cake is decorated with Blossoms & ribbon picks. 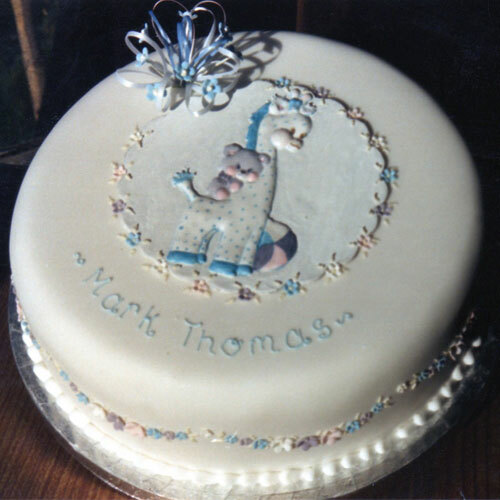 It features a Royal Icing, flood work, toy giraffe on a plaque to be kept as a souvenir. 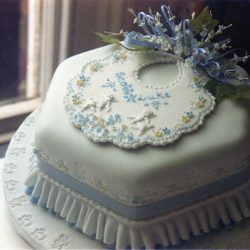 The side of the cake is decorated with Blossoms & the base is finished with a Royal icing, piped border. 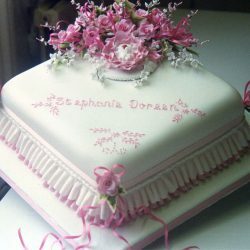 This fondant covered cake is decorated with pink Roses, white Blossoms & white Lily of the Valley. The side of the cake features a pink ribbon under fondant eyelet lace. The silver cake drum is finished with a matching pink ribbon. 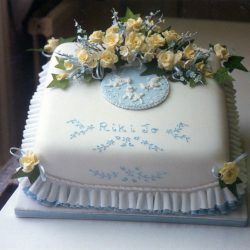 This cake is decorated with yellow Roses, blue Blossoms, blue ribbon picks & Ivy Leaves. 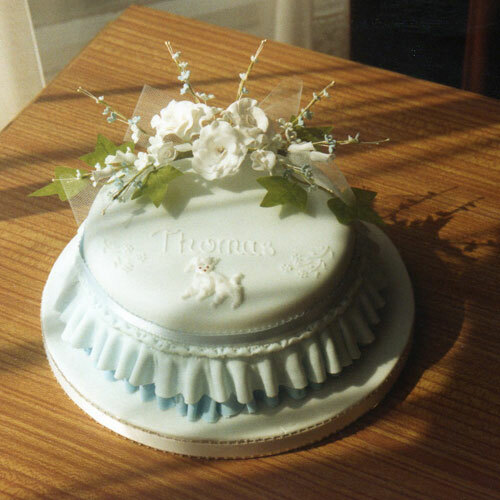 The top and sides are piped with a blue Royal icing, free-hand, design, white Royal icing, piped lambs & finished with a double Garrett Frill. This cake is decorated with pink Roses, white Blossoms, Ivy Leaves & a baby in a pink crib. Shades of pink Blossoms are used to make designs on the fondant. The sides are finished with pink ribbon and a double Garrett Frill. This Christening cake is decorated with open, white Gardenias, white Blossoms & Ivy Leaves. The top of the cake is piped with a Royal Icing lamb and the side of the cake is finished with a pale blue, satin ribbon and a double, blue & white Garrett Frill. This cake is decorated with yellow & blue Blossoms & Ivy Leaves. The top is freehand piped with blue Royal Icing & there is a blue Teddy Bear made out of modelling paste. The sides are finished with blue ribbon and a double, blue & white Garrett Frill. This cake features white roses, yellow Carnations & blue Blossoms. 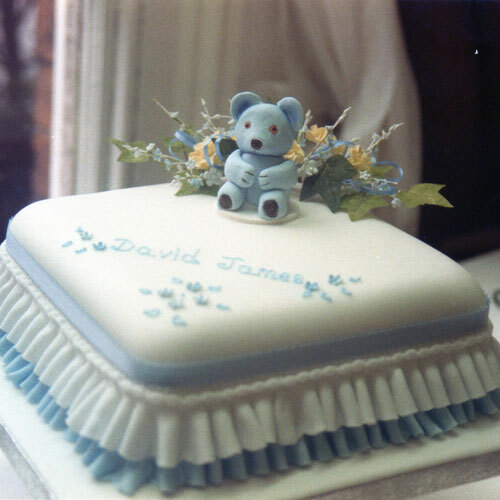 The top and sides are piped with a Royal Icing, free-hand design & white Royal Icing piped lambs. 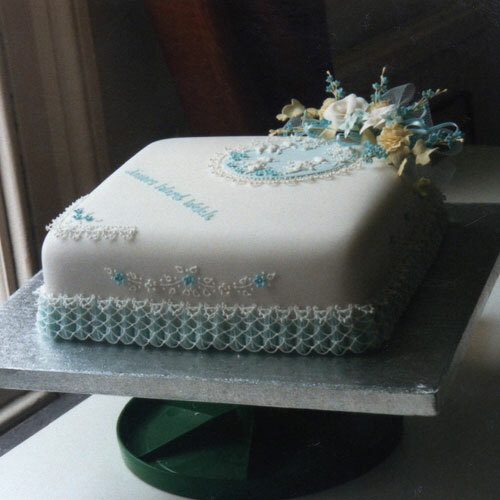 the base of the cake is finished with Royal Icing string work & lace. 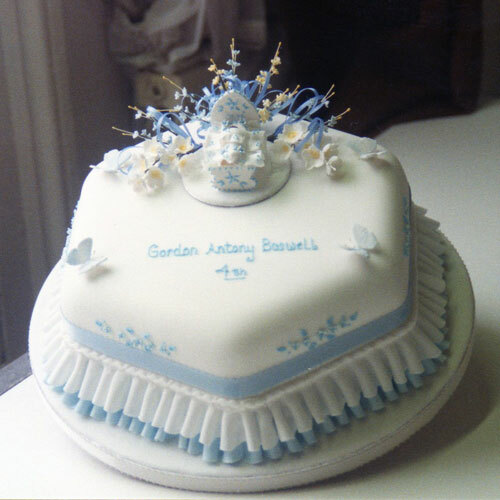 This cake is decorated with white, blue & yellow Blossoms, a crib, and 4 butterflies. Pastillage is used to make the crib and the butterflies, which dries hard, keeps its shape & is resistant to humidity. The cake is finished with a double, blue & white Garrett Frill. This cake features blue & white Blossoms & Ivy Leaves. On the top of the cake is a pastillage baby’s bib with Royal Icing lambs and flowers. It’s finished with a Garrett Frill & the fondant covered board has embossed rabbits around the edge. This cake is decorated with a spray of pink Roses & white Blossoms arranged around a baby laid in a large, double, pink Blossom. 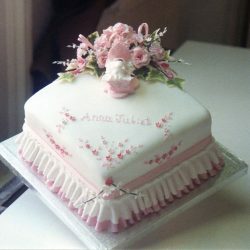 It has a pink and white Garrett Frill & the cake & the fondant covered board have matching ribbons.